For something different add a few drops of fresh lemon juice or a slice of lemon.>!! 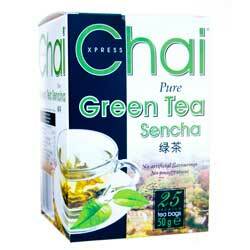 Ingredients: 100% Pure Green Tea Sencha. Blended and packed in the UK, this product is suitable for vegetarians and does not contain any artificial flavourings or preservatives. "Dear Spices of India, As a lover of indian food its a joy to be able to get all i want very quickly, can not recommend highly enough, man many thanks,"